The following news article from Jan 30, 1968 tells of just one of the many meetings between Antipope Paul 6 and leaders of the Judeo-Masonic B'nai B'rith. It relates among other things, that the Marrano Jew Montini (A.K.A. Antipope Paul 6) accepted gifts from his fellow deicides at their cabal, which included a "silver Kaballistic box." The article appeared in the Jewish Telegraphic Agency. Pope Paul VI assured two Jewish leaders here yesterday that wherever and whenever persecution of the Jews occurred, he would speak out against it. He said that his greatest desire was to rectify the wrongs of the past. The leader of the Roman Catholic Church held audience with Dr. William Wexler, president of B’nai B’rith, and Herman Edelsburg, director of its international council, who are touring European capitals. The Jewish leaders exchanged gifts with Pope Paul. They presented him with an 18 century amulet and a silver Kaballistic box. The Pope gave his visitors a gold medal and a newly-published book on St. Peter. Dr. Wexler gave the Jewish Telegraphic Agency a report on the Papal audience. He said that he and Mr. Edelsburg had informed the Pope that “steady progress is being made in implementing the Vatican Council’s 1965 declaration on the Jews although certain diocese in certain countries lagged behind others in updating the catechisms and textbook references to the Jews. Their information was based on reports received by the B’nai B’rith from 46 countries. 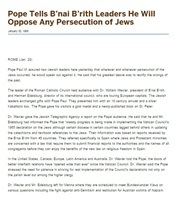 They referred specifically to Spain where Jews and Protestant minorities are concerned with a law that require them to submit financial reports to the authorities and the names of all congregants before they can enjoy the benefits of the new law on religious freedom in Spain. In the United States, Canada, Europe, Latin America and Australia, Dr. Wexler told the Pope, the doors of better interfaith relations have “opened wide than ever” since the Vatican Council. Dr. Wexler said the Pope stressed the need for patience in striving for real implementation of the Council’s declarations not only on the parish level but among the higher clergy. Dr. Wexler and Mr. Edelsburg left for Vienna where they are scheduled to meet Bundeskanzler Klaus on various questions including the fight against anti-Semitism and restitution for Austrian victims of Nazism. How much more... the Antipapacy today "canonized" a Kabbalistic Jew, Giovanni Battista Montini, (A.K.A. Antipope Paul 6).